In this ceramic class we'll learn how to fire bisque. 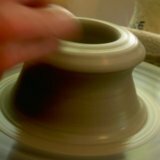 Bisque Ceramics-is the middle step in pottery. After the pot had been formed and dried it is bisque fired. The bisque fire cooks off any residual moisture from the greenware and hardens the pot partially so it is ready to glaze. 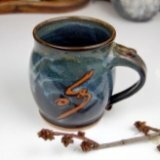 Bisque is more durable than ceramic greenware and is easier to work with when painting clay pots with glaze. It is only partially fired, leaving the clay porous, which also helps it to absorb pottery glazes for a more durable finished pot. Tip: There are two keys to successfully firing pottery bisque. First, dry the greenware completely before firing. Second, increase the temperature very slowly. 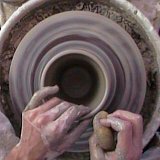 The following is an overview of the bisque firing process. At least two hours before you begin firing make a cone pack. To do this, form a bar of clay 2cm x 2cm x 10cm. Poke it full of holes with a clay needle, especially if it is recycled or homemade clay. This will prevent it from exploding in the kiln. Place three pyrometric cones into the clay, cone 09, 08, and 07. Most bisque ceramics are fired to somewhere between cone 08 and cone 05. I fire all of mine to 08. Be sure that the cones are angled slightly (8 degrees) so that they'll curl to one side when they melt. The great thing about ceramic greenware is that it isn't covered in glaze. You can pack the kiln very tightly without worrying about the glaze on the pots welding them together. Walls and rims can touch without any worries. They can even be stacked if done carefully. Tip: Avoid stacking large, heavy pots on top of small, delicate pots. Several pots can be stacked if you put smaller, lighter pots on top. If your kiln uses a kiln sitter, be sure to place a small 08 cone in it before loading. It's very frustrating to load the whole kiln and then have to unload it just for that one little cone. Place the kiln shelf posts into the kiln first, then load the greenware around the posts. If you place 4" posts on a shelf try to find pots that are just under 4" to maximize kiln space. Continue stacking pots and kiln shelves all the way to the top. Important: Remember to position your cone pack where it will be visible through a peep hole. Make sure no pots are blocking it. You can place a piece of broken kiln shelf or fire brick under it if the peep hole is too high. When firing bisque ceramics, think like a tortoise, slow and steady wins the race. Leave the door propped open 2" and the peep hole plugs out for at least the first hour. Start at the lowest heat setting. After an hour, close the door and the peep holes. Continue to fire slowly until you reach cone 08. Turn off the kiln. Leave it closed and allow it to cool completely. Cooling can take from 24-48 hours. Opening the kiln too soon can shock the ware and cause cracking. Once you turn the kiln off, it's best to forget about it for a day or two. When you do finally open the kiln, feel the pots on the top. They should be room temperature. Important: Always follow the manufacturers recommendations for operating your pottery kiln. Use proper eye protection when looking into the kiln peep holes to prevent eye damage. 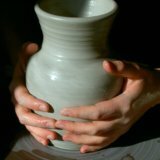 Thanks for reading about how to make ceramics and how to fire bisque ceramics. Happy Firing.